These are our three favorite towns in New Zealand. We spent the bulk of our time in these three charming places and enjoyed them immensely. Read on to find out why these are the best places in a pretty cool country. 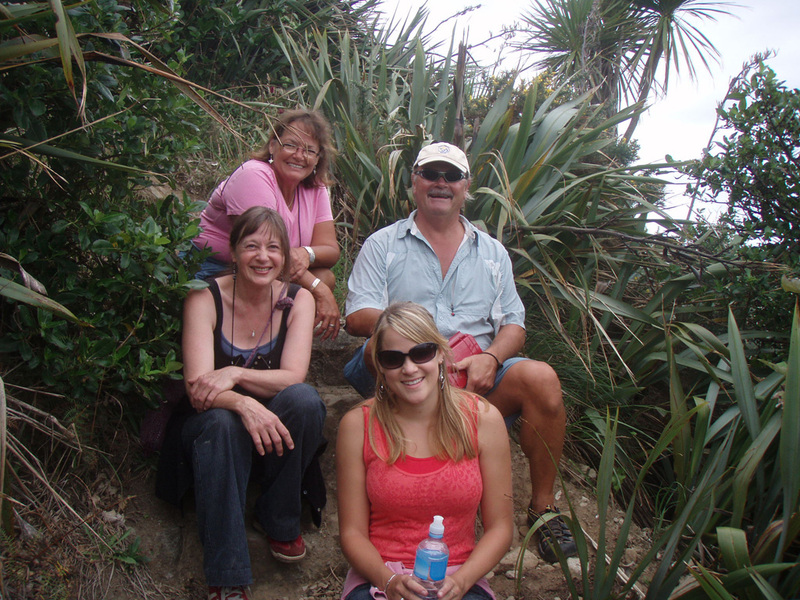 We chose Tauranga as our New Zealand base camp. Tauranga is the only marina on the north east coast with berths for a twenty foot wide catamaran. Other marinas had pile moorings available, but that was not what we wanted. We tried a pile mooning in the wonderful town of Whangarei, but the boat grounded in the mud at low tide and the dingy was needed to reach the shore. 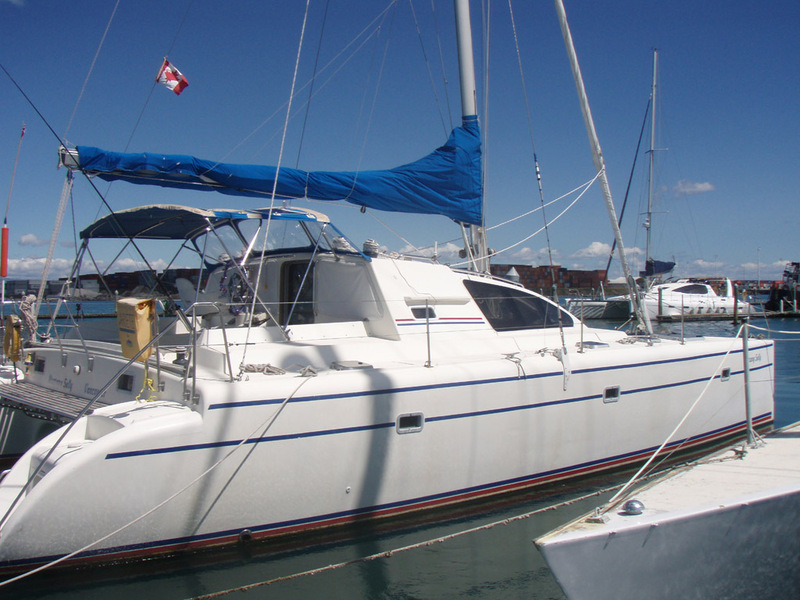 We wanted a place where we could hang out, easily get on and off the boat and live like we live on the boat at home. We were tired the constant traveling and wanted a place to settle in for a while. It was a little expensive for moorage but Tauranga fit the bill. The Tauranga Bridge Marina even had floating breakwater like our old marina back home. The Tauranga Bridge marina was in the Port of Tauranga which is a little industrial. It had. large scale export facilities like containers, logs, and metals. Even so, it was close to everything and was a great home away from home. Click here to see some views of the marina that we used as a base camp for exploring New Zealand from December through to April. The people at Tauranga Bridge Marina were great. We made lots of friends and it seems we were just starting to feel really comfortable there, when it was time to move on. 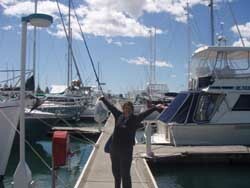 Thank you Tauranga Bridge Marina – you are great and we miss all the wonderful people there already. We were delayed waiting for weather before leaving Tauranga. On the day before departing we were involved in a tradgedy. Click here if you have a strong stomach for the grizzly details. 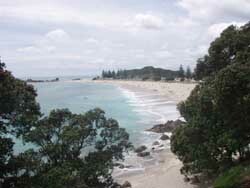 This is the place where New Zealander go to play on the beach. The beach is many miles long and in the heat of the summer there are hundreds of surfers spread out up and down the beach. Thousands of people sunbathing and playing in the sand and surf. Beach volleyball, marathons, surf and life saving competitions – lots of things to keep the activity addicted Kiwis active. The two cities of Mount Mangauni and Tauranga are right next to each other. 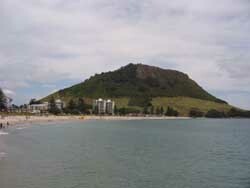 The three main assets of Mount Manganui - aka The Mount - are two beautiful golden sand beaches and a lovely mountain. The eastern beach is exposed to the south Pacific and gets big surf. This is the beach for the young and the hip. Beautiful sun tanned and fit bodies are constantly on parade. The trendy coffee shops and restaurants are constantly full of attractive people. Apparently the region has had double digit growth rates for year and the locals lament how much it has changed. But for us it was a pretty cool place. Another beach is within the harbor and is protected from the ocean swells. The old folks and families with young children hang out here. Water sports for the young and swim training go on constantly in the summer. Lots of boats are anchored or moored for free just off the beach. Lastly there is the Mount. With lots of pathways this is a hikers dream. Take the easy walk around the bottom or challenge yourself with the climb to the top. No matter what kind of shape you are in there will be some Kiwi come along who will run or walk faster and make you look like you are out of shape. But those well developed Kiwi bodies make terrific eye candy. .
With its wonderful strip of side walk cafes, upscale shopping and great beaches, Mt Manganui was a strong reminder of our home town of White Rock. Home sick we are! We used the Mountain paths in our daily fitness regime. Click here for a look at some Mt Manganui scenes. Here for a panoramic look from the top of the mountain. We really like this town. Our good friend, Carol Noyes and her family live here. They made us welcome in New Plymouth and showed us the town and their magical Mount Taranaki. The city of New Plymouth is on the west coast facing the Tasman Sea. They have a killer park and venue for music concerts. The venue is a large natural bowl set within this beautiful park. When we toured the park there were a half dozen acts underway – some musical and some child oriented but all good fun. A WOMAD concert and a half dozen other popular bands put on shows while we were in New Zealand. Many cruisers took in shows here – but alas – the timing didn’t seem to work for us. Check some New Plymouth scenery here.